One day we have read the article from one of very big press brake machines manufacturer about the advantages of original tools. In two words all the advertisement follows two main ideas - quality of tooling and complete package from one hands. And we would like to comment some words about it. In the world there are hundreds of press brake manufacturers with all type of quality, technical possibilities and prices. Normally if you will buy press brake from any manufacturer you can request the offer for tooling and supplied press brake tools probably will be marked with the name of the manufacturer. But the story is that less than 10 manufacturers in the world have really tooling production inside without external purchases. All other use standard cooperation possibilities to buy tooling mainly in Italy, receive it, mark it and sell to the customer. Yes, really probably it could be even economically reasonable because press brake producers usually have best discounts for tools but from other side tools will go for examply from Italy to Turkey and after that will be sold together with the machine to the customer to be returned back in EU. So finally - there is no any additional quality because normally manufacturers supply the same tools. Yes, could be other special cases but they are exceptions to the rules. Yes, customer normally prefer to get all from one hands. In one side it is more safely and from other side manufacturer will be responsible for the project at all. And mainly if the manufacturer made the obligations to bend the complicated part we will recommend to buy the bending tooling from him as the guarantee for everything. But if the customer will purchase press brake as just the machine and standard tooling without any study of parts just as general set for everything it is better to save money and to look out for other offers. What does this all mean? 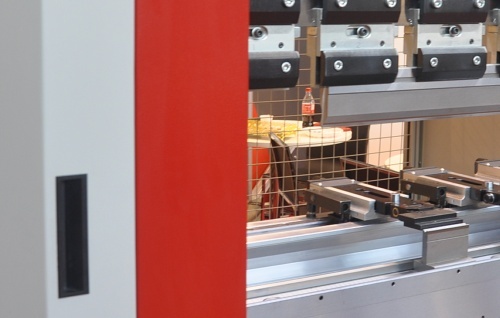 Normally only one thing - European press brake tools are usually with high quality and the subject "non-original" means nothing if the manufacturer really doesn't have the dedicated tooling production. The manufacturer could be holder of "know how" or moreover has his own experience with complicated repeated applications. But the choosing of other supplier for tools doesn't mean the loss of quality but could be the reason for cost savings. At the end... Original is not original everytime. You can pay for the other logo but the metal is the same.